In 2000, Ottawa veterans decided to honour Gander and have him decorated posthumously with the Dickin Medal. Considered ‘the animal’s Victoria Cross’, this British decoration is awarded for ‘conspicuous gallantry or devotion to duty’ in action. Gander is the first Canadian dog to receive this medal. There are other mascots that have risen to fame, such as Batisse the goat, who to this day guards the Quebec Citadel. As the mascot of the Royal 22nd Regiment, he is an active participant in official ceremonies and can be seen proudly parading in full regalia. The Batisse line of mascots dates back to 1955, when Queen Elizabeth II offered the regiment its first goat from the royal herd. The 10th and current successor was officially presented to the regiment by Governor General Michaëlle Jean on September 23rd, 2006. Although Batisse has never had to prove his fierceness in battle, he is nonetheless the pride of his regiment. Several other mascots have honoured the ranks of the Canadian Army, and their stories are all quite fascinating. But what drove soldiers to take on the charge of caring for these four-legged recruits? Imagine that you are young, healthy, in love…and war suddenly breaks out. You are drastically uprooted and depart for the front, leaving behind friends, family and fiancée. Your stiff upper lip and pride-swelled chest do little to hide feelings of inner turmoil and uncertainty. Then a small kitten, taken aboard your ship to chase rats, soon becomes a travel companion who is eager to lend a sympathetic ear in exchange for a little affection…the bond is sealed. Some animals carried out specific ‘duties’: cats sometimes guarded provisions and dogs would occasionally act as ambulance attendants to search for wounded soldiers. Most were pets that the soldiers simply adopted for companionship. In the tumult of war, however, these creatures soon became a reassuring presence, a faithful friend, a good luck charm or a welcome distraction. Over time, the pets became full-fledged members of the regiments when soldiers came to designate them as their official regimental mascot. 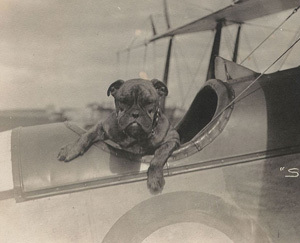 Among the treasures in the Military History Research Centre is a wealth of surprising photographs: dogs, cats, goats, bears of all shapes and sizes parading proudly among military units and formations. It’s a veritable Noah’s Ark of morale-raising critters!